East Midlands commercial finance specialists, Sterling Capital Reserve, has brokered a £1.5m loan to bring forward a new student housing development in Nottingham. 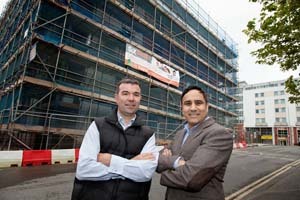 The finance package has been put together to develop Six Degrees, a brand new 46-room, purpose-built, apartment block for students in Nottingham city centre. The scheme, by local man Taj Ubhi is set to be finished by September 2013. Nic Rotton of Sterling Capital Reserve, said: “Taj’s story is a familiar one; he is a successful local developer who had found a site and obtained planning permission. He had tried all the usual bank sources with no luck. Sterling also operates a mezzanine finance company Strata Finance – a 'dating agency' for borrowers and lenders within the commercial property market. It is also the regional sponsor for ThinCats.com, a peer-to-peer lending site which unites investors and borrowers.